AUL Corporation, America's largest national provider of used car service contracts, chose ProExhibits to design their 30 X 30 exhibit environment launched at the National Automotive Dealers Association Orlando show this year. Says Marketing Manager, Jacqueline Swank, "The ideal exhibit solution ultimately needed to reflect our unique approach to serving agent and dealer clients. Our priority is exceeding the expectations of each individual working with us, person-to-person. We go the extra mile every time. Given our culture and values, ProExhibits created a fresh, inviting environment designed for comfort and conversation first, while using the latest technology to showcase our brand and our proprietary programs." 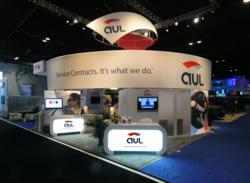 The exhibit structure was cleverly designed to reflect AUL's distinctive new logo and corporate identity. Tension fabric was utilized to create seamless curves over a large space. Custom counters reflected the same curve and incorporated an unusual LED lighting solution. Several new lighting techniques were utilized, including the projection of AUL's logo onto the carpet. A custom-designed rotating hanging sign completed the look and ensured visibility from anywhere on the show floor. Says Ms. Swank, "Multiple layers of hospitality were then developed inside the structure, including a conference room, coffee service, couches and several monitors for viewing convenience. We've had many more visitors than ever before, visiting with us for a much longer time than ever before." What did AUL appreciate most working with ProExhibits? "We're in the service contract business, not the building of exhibits business." comments Ms. Swank. "ProExhibits added their vast experience and knowledge to all areas of our presentation. They handled everything proactively which freed me up to develop other areas of responsibility. I can't tell you what it means to be able to rely on their expertise and to put into action an exhibit perfectly matching our needs." ProExhibit’s website can be accessed at http://www.proexhibits.com. ProExhibits is an award-winning design and production team of exhibit, event and environment experts serving clients worldwide since 1987. ProExhibits is best known for superior marketing solutions that enable clients to enjoy unique brand and sales advantages in today's highly competitive marketplace. As a team, ProExhibits specializes in exceeding expectations, exemplified by a 99% customer satisfaction rating year after year. They welcome the opportunity to utilize their combined talents, resources and industry knowledge to guarantee your success.